I was born into a wonderful family with four boys. Being the only girl amongst these wonderful guys, I learned to be tough and go for anything that I could dream of. Growing up, I had so many dreams — dreams to be a very great woman so that I can give back to society what I have been given. Dreams to be the first female “something” in Ghana someday. For a girl like me growing up in a society where children would leave school because they believed it was not a perfect fit for them, these dreams were seen to be too great and only dwelled in the confines of my imagination. However, like Albert Einstein once said, “Our imagination is more important than our knowledge. For knowledge is limited to all we now know and understand, while imagination embraces the entire world, and all there ever will be to know and understand.” I embraced the world, I denied a life of small dreams and said yes to a life where all my dreams would come true. A life where a girl like me would be graced with the opportunity to be at Ashesi. This scholarship is what made my Ashesi dreams a reality. It is the reinstallation of hope of a brighter and better future for myself, my family, and for Africa. The donors of this scholarship have indeed created a future where the future of every young person is not determined by his or her financial status but is limited to his or her imagination. Ashesi University is a place where young people are trained to be great leaders. I chose Ashesi because of the environment it creates for its students to become ethical leaders of tomorrow. Ashesi is challenging, however, I believe after going through Ashesi there will be no hurdle that I cannot overcome. I am studying Electrical & Electronic Engineering because I have always had a passion for building things and making things work. I hope to bring transformation to Africa’s technological feats after earning my degree. My summer was great. I succeeded in building my first-ever robotic arm and conveyor belt with my Ashesi engineering team. The process was very insightful and fun, but it was very stressful. Prior to the evaluation, a very unfortunate situation occurred. Our breadboard stopped working, and it affected all the components of our circuit. Fortunately, everything turned out well in the end. Every moment that I spend in my electromagnetism class means a lot to me, and I enjoy every single bit of it. I find it so amazing how the electric field and magnetic fields have this inevitable connection; the presence of one induces the other. 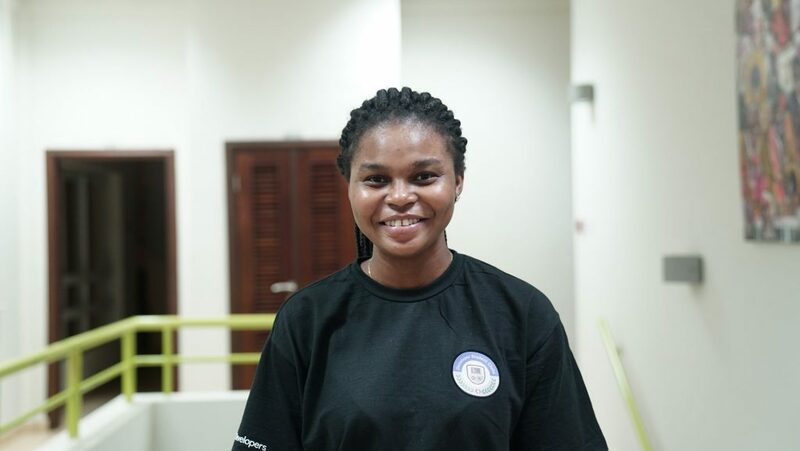 I want to create a future in which Ghana is recognized globally as a technologically advanced country by advancing in my career as an electrical & electronic engineer and training more young people in the technological field.